Home» tips and tricks» How to tell if your iphone is Hacked? At the end of the article, you will be better able to identify whether your iphone has been hacked or not? Another major reason to enhance phone protection is that all of your important conversation, important contact, notes, documents, media, etc are stored in your Iphone. If some body else has got control over your phone, then he will be easily able to access your accounts & that can cause further damage to you. Iphone Users will be now able to identify whether their phone has been hacked/ jailbroken or not with the System & Security Info app. Jailbreaking mean that now your phone or device will be able to run/execute those program which are not approved by Apple. These programs will cause a great danger to your phone data & with the help of these software, the hacker can have an eye on all the activities you do on your phone. What does System & Security Info app do? System & security info app check whether your iphone has been jailbreak or not? It also check whether there is any malware present or not? It also check the security threats of the iphone & tell you about the security level of your phone. 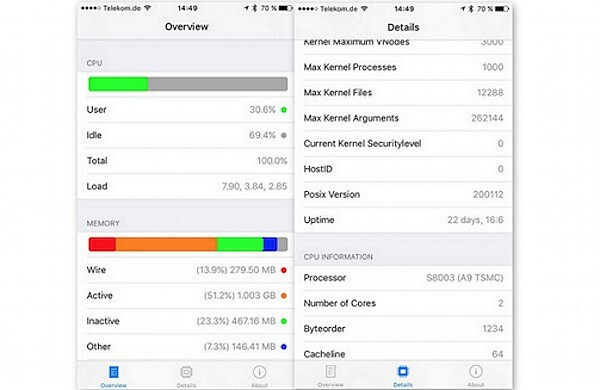 It will also show you about CPU usage, disk usage, & memory usage of your Iphone. Another dynamic feature of System & Security info app is that it will show you all the running processes on your Iphone. It is the only app that could do so. The working of this app is quite simple. After the processing, it will tell you about the report of your iphone. A green color indication will tell that phone working is fine & there is nothing wrong with it. A red light indication will represent that there is some security threat with it. If the app found that your iphone is jailbroken, then it does not mean that some hacker or stealer has took charge over your phone. There are many phone that are jailbroken so that they could be able to run other programs that are not approved by apple. For enhancing the security of your Iphone, & finding out whether your iphone has been hacked or not, System & security info is the best app to do so. It will monitor your phone performance & will give you complete memory & disk usage report. Also Read: How to lock Whatsapp in Iphone 7? Have you got Jailbroken Iphone? If you Iphone is not jailbroken, then it is very very difficult for any body to hack it or have an eye on your activities. The unbroke jail broken security level is much enhanced & no body could be able to remotely access or monitor it. If you have got jailbroken Iphone, then its security has been broken. It can be hacked & it become difficult for you to analyze whether there are trojans or malicious programs installed on your Iphone. 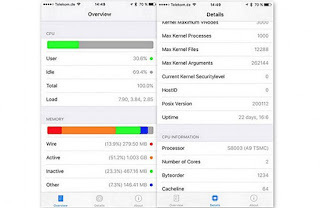 System & security info app is the best way to analyze the complete performance of your Iphone. The security of Jailbroken Iphone is not guaranteed. Are you Sharing your location with Any body? With the Find Friends app, check whether you are sharing location with any body else or not? If you are sharing your location with somebody, then immediately delete it, otherwise its okay. You are safe. If you are seeing those apps which you do not nor have not you installed them & they are not recognize to you, then the first & most important step is to delete them as soon as possible. These are small small steps which enhance security of your Iphone. If your phone has start behaving odd, then that mean there is some thing wrong with it. If it is interrupting you in between of your working, or it is automatically sending messages, then that mean your phone has been remotely controlled by some body else. Are you Facing unknown Apps? If you are facing apps which you have not installed but still they are present in your Iphone, then that mean somebody else is trying to steal your data by sending different trojan. You must immediately delete all those apps & install a good Antivirus that must scan your phone for harmful programs & delete them. If your phone has automatically been locked & it is asking your for money in order to get unlock, then your phone has been hacked by somebody else. If you have download any app by following a text message, then you must confirm whether that text has been sent by some official company or not? If not, then you must delete it & scan your phone for the deletion of viruses. The viruses are designed according to the current version of your phone. If you update your phone version, then it will minimize the effect of those viruses. It will enhance your phone security. Must Read the Signs that can tell whether your phone is hacked or not? My Phone was hacked. How do I fix it?